Beggs community is remembering 18-year-old Kayson Toliver, a star runningback and senior at Beggs High School, after he was shot and killed early Thursday morning. Those closest to this tragedy still trying to make sense of it all, which includes students at the high school where the victims attended. 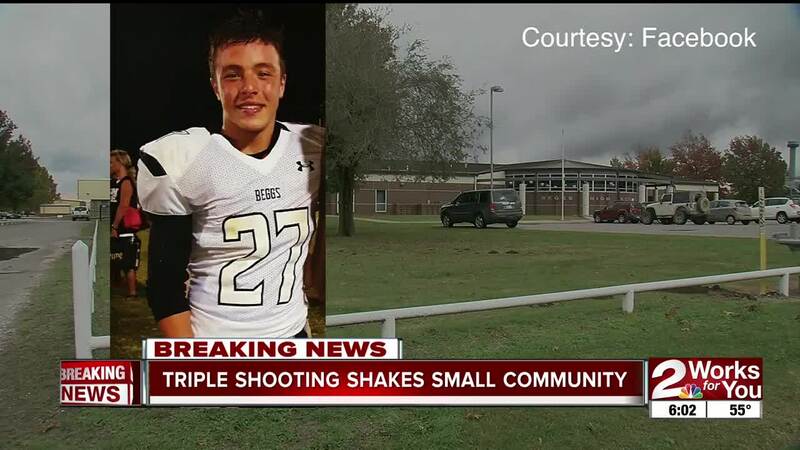 The teenager killed in this morning’s shooting was an 18-year-old senior at Beggs High School and a running back on the football team. His two sisters – one a junior and the other a freshman – were wounded in the shooting, and the both were active in school activities. Shock is rippling throughout the community and some friends of Kayson Toliver are expressing their love for him on social media. Many of the students at Beggs left today and were given an excused absence so they could grieve their classmate. “I think they're great kids that you just want to put your arms around the family and support them and help everybody make it through," Beggs superintendent Bryan Terry said. The superintendent says the district offered counseling throughout the school day in case students needed to talk to someone. A candlelight vigil is planned Thursday at 6:30 p.m. and will be held at the school’s event center, also known as The Dome.